On November 9th, Donald Trump won the presidential elections in the US. The country has been divided, with many not accepting the president elect, causing protests in defiance all over America. But, no matter who you voted for, and what you stand behind, we can all agree on one thing: these elections have made history. A woman has almost been elected president and a man with no political experience is set to take over the office instead. Again, I cite newspapers and social media posts: “THIS ALREADY MADE HISTORY”. Some of you might wonder what am I talking about, and what’s my point of underlining ‘made history’, when the title of the article suggests that I want to talk about travel. Many will say that neither of this would ever affect them, since they live in Europe, Asia or Australia. Unfortunately, it will – and it was meant to affect everyone no matter who would have gotten elected. Let me explain why. The effect on the world and therefore the travel industry has nothing to do with anyone’s love and hate for any politician. I’m not here to discuss what I think about Donald Trump, Barack Obama or Hillary Clinton. My only statement in this matter would be that while I hear that someone was or will be the worst president ever, I’ll tell you this: America has not yet had a truly bad leader. So let’s stop insulting others who voted for another candidate and compare this situation to other countries and events from the past. It doesn’t look that bad. Great, looks like we’re all on the same page now, so let’s move on to the more important topic. What scares me, however, is something related to both situations: people’s opinion on travel, and therefore the future of the travel industry. And why I fear for its future. But neither of the candidates say anything about travel (apart from immigration issues) – one would say. They didn’t have to, you all did instead. Over the last couple of weeks, and especially today, many fellow travel bloggers posted their reactions to the results of presidential elections. It comes as no surprise, as both Clinton and Trump supporters got pretty startled after the results came in. Articles appeared on many travel blogs, social media channels, and even in some newsletters. A similar thing occurred after the Brexit referendum a few months ago and the abortion criminalization proposal in Poland. And while I haven’t commented on these situations, I can’t stay quiet anymore. Why? 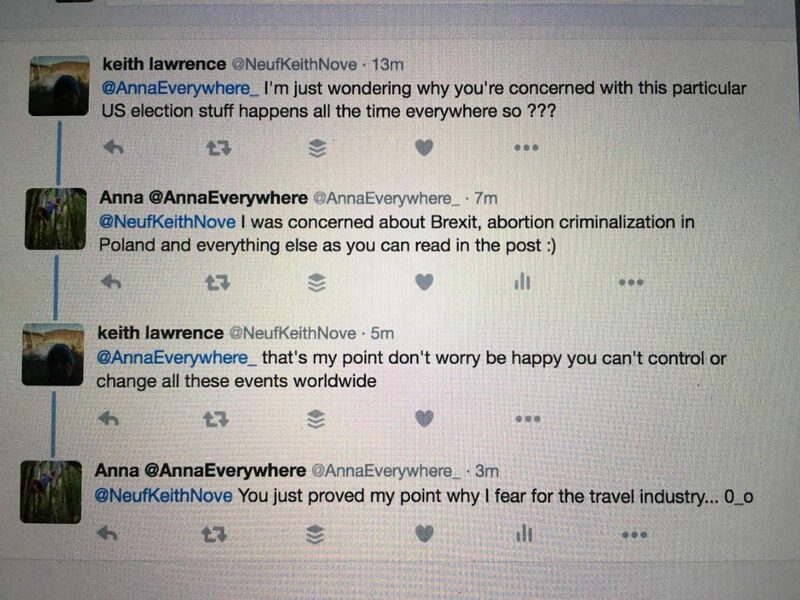 Please stay out of politics and stick to the travel blog. I am doing my part to save the world by not voting for Hillary. How sad that you would misuse your platform to push your political agenda. I follow travel pages for specific reasons … no offense, just not interested in your political views. Feel like unliking your page dude. I don’t follow you, to get spammed with all these. Can’t believe you’d share such things here. I should have unfollowed you earlier. I can bring up many others, but I think you get my point. Did we (humans) really become so ignorant to think that politics has nothing to do with travel?! Or we’re just ignoring any issues the world is facing at the moment? That’s the blood-curling issue here! It seems to me like all we want these days is to read these infamous ’10 best things to do in Paris’ articles to find some cute places to take photos of and move on. Nobody seems to be very interested in what’s actually happening in a certain place. Everyone wants to hop from one country to another as quickly as possible, ticking every place off the list and move to the next one, without learning anything about the past (and present) of the places we visit. I see it even on my own blog. My posts that touch the history, human rights or any other problems aren’t the most popular. Since when do we tune off when a ‘travel expert’ says something on top of cool things to do and posting pretty photos? 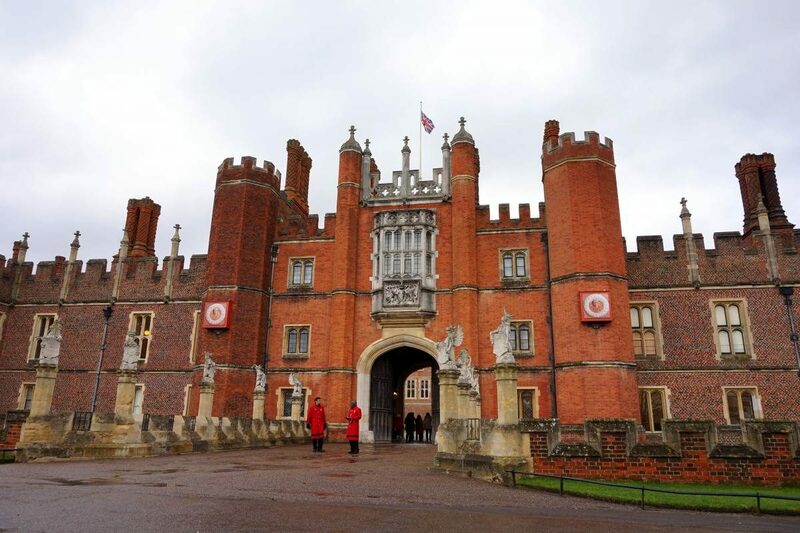 Hampton Court – I heard from many travelers that it’s a ‘boring place’. Did they know that the Act of Supremacy was signed there? Did they know why it was signed? No. Who would have thought that a simple love affair of Henry the VIII would cause a reformation and create the Church of England we have now – almost 500 years later. Is it still a boring and insignificant to tourism story? Believe me, I understand your frustration even more than anyone else – I accidentally had to study politics and law when I didn’t really like it (that’s a story for another occasion). There’s been a lot of political talk and frustration recently, but it affects ALL of us, no matter who or what you voted for. We can’t hide from it and pretend like nothing’s ever happened. This isn’t what travel is, or should be about. Every place has the history, every country has the culture. Inevitably, it has A LOT to do with politics. Pretty churches were built because of politics, castles were built because of politics, many cities and houses were designed by politics. Even fashion and food trends are a result of culture and politics. Let me give you an example of the Black Monday protests in Poland not so long ago. Polish women, together with many foreigners, came out on the streets to pummel the proposed abortion ban that periled lives and the futures of many in Poland. What does it have to do with travel again? Well, apart from road blockages and everything in the city closed that day when it happened… If this law passes, it will inevitably change the perception of other countries on Poland. It could cause a possible alliance or lack of it with some other countries. We won’t know that today. Also, not to mention it will encourage ‘abortion tourism‘. I don’t think I need to explain how the word ‘tourism’ is related to travel. But nothing has happened, the world hasn’t changed – some would say. Most changes don’t happen overnight. However, the argument that the world is still standing and let’s not talk about it is, excuse me, but simply ignorant. Most changes are insidious. Do you like to snorkel when you travel? Who doesn’t like watching some cool colorful fish hanging out on a coral reef. Then you might be happy to hear that the recent elections in California might have extended your possibility of snorkeling around the world. But who cares, it’s all politics, right? California banned plastic bags that have a huge impact on oceans, marine life and reefs. The passing of Prop 67 will eventually save roughly 123,000 bags from potentially ending up in the sea every year. 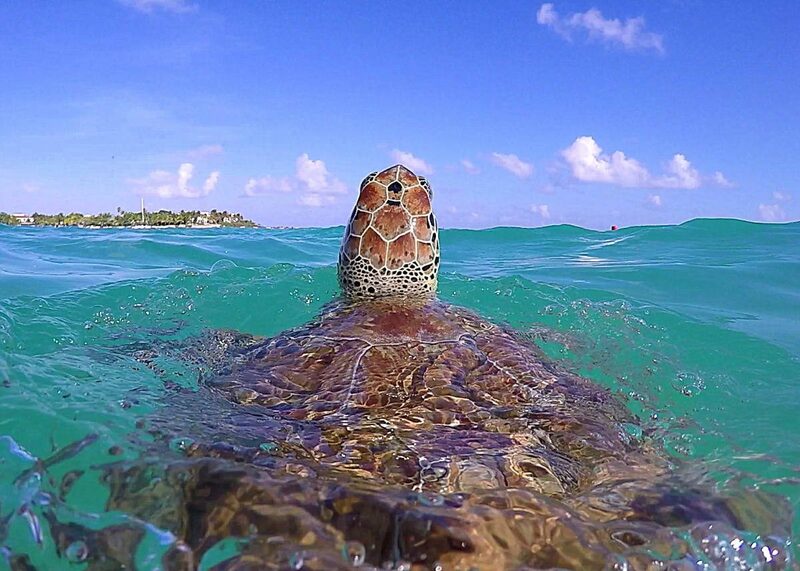 It might save this turtle’s life. Correct me if I’m wrong, but conflicts in some countries, whether military wars, religious intolerance or simply entry restrictions, impact tourism. They make many want to visit some countries, or not. That’s politics again. I was actually about to travel to Istanbul, the capital of Turkey, in 2 weeks time. The purpose? A Travel Summit. But I’m not heading that way anymore, as due to the political situation in Turkey the conference got canceled. Many travelers are also afraid of visiting Turkey at the moment. How’s that not connected to politics again? Clearly, politics has everything to do with travel. It might not have direct results today or tomorrow, but everything that’s happening right now will affect us in the future when we travel, or even if we don’t. Since we all tend to agree that these elections ‘already made history’, and history is very often made by politics, maybe we should also stop pretending that nothing has happened. Its outcome will affect the world we live in and therefore the travel industry. LITTLE BONUS FOR THE END – WHAT HAPPENED AFTER I TWEETED THIS POST? Someone just proved my point. Trump has not addressed tourism specifically. However, I noticed that after various protests against his regulations such as banning abortions, banning talks regarding climate change, and more importantly – the Muslim ban forbidding people from 7 countries entering the US despite their legal visas, other passports and EVEN green cards, started talking about boycotting travels to the US. Sidenote: the Trump Hotels website is decidedly international, available in several languages, including Arabic. Please, tell me – are people really not interested in learning about the world history and current affairs while they travel these days? What are your thoughts on this issue? I am English but live In Scotland so have experienced first hand the Scottish referendum. Likewise I have been here throughout Brexit so far. That alone makes me fear for the travel industry. Not only will I potentially not be able to freely roam Europe but we could potentially miss out on the diversity we currently have within the UK (of tourists and people living here). Travel educates me and makes me a better person. I happened to be in Poland on black Monday. I may sound ignorant but until I saw the protests I had no idea what was going on. Likewise I was in America until the day before the vote. Yes I knew about it but being in the country and seeing the build up first hand is totally different. Politics, history and travel go hand in hand. Whilst I disagree with people trying to force their opinions upon others I do admire people who are willing to express their opinions and they should be applauded, not abused for it. The very REASON I travel is to learn, both about history and culture as well as current events and politics. I am planning to move abroad next year and to start a blog/YT channel about it, in order to share what I’m learning. So, thank you for this piece. It’s good to see I’m not alone in my desires to have travel influencers talk about more than the “top 10s” and how to take pretty photos. Definitely not alone! 🙂 Where are you moving to Erica? Fantastic post! I recently discovered your blog and this might be my favorite of your posts. First, I have to say that even though you don’t live in California, it’s so impressive that you know that we voted to ban plastic bags! Not many people are that well informed on politics to know about state laws. Also, you are so right. Travel has everything to do with politics. We can’t travel and discover other countries and not pay attention to how politics affects them. It is part of life and everything. Thank you for this post and being brave enough to write about an unpopular topics. Anna, not sure how well you know American history, but your phrase: “America has not yet had a truly bad leader” is simply wrong. America HAD quite a few really bad leaders who ended up committing acts that were (and are) considered evil. Those leaders killed hundreds of thousands, brought destruction and lots of consequences for the nation and the entire world. Not sure what you were trying to really say with your article ????.. will the travel world change with Trumps election? Yes, it surely will. As well as everything else..
Let me explain. Sure, the US have had bad leaders (btw who are you referring to?). But none of them were as bad as some leaders of USSR, Korea or China. Anya, I don’t know how much you know about American history, but your phrase: “America HAD….committing acts that were (and are) considered evil”, rings of a twisted world view that places America at the center of many of the world’s problems more than a serious critique of America’s past actions. Yes, America has it’s original sin of slavery and the deaths of Native Americans (on its westward expansion to the Pacific), but it has an amazing ability to correct itself for its past sins, whereas most countries on this planet won’t even recognize its sins. Every country of significance has actively participated in a dark sin, but few have corrected itself for the better like America. If we were to speak of the current world order system led by America, that is being threaten by the likes of China, Russia and Iran, no single country has contributed for the good of Mankind than America, period. I couldn’t agree with you more!! As a political scientist and former journalist (and now travel blogger) it amazes me when I get similar hate mail – ‘stick to travel’ garbage. Travel IS politics. We visit certain places because they are safe – and they are safe because of government policies. We visit places because they are beautiful – politics again. If governments allowed litter or spewing fumes on the roads or destruction of forests, these places wouldn’t be half as beautiful. Who wants to share a turquoise tropical bay with dead fish and flotsam? I won’t go on but suffice to say I share your view entirely. This post really resonates with me. I appreciate how you’ve taken the time to really thoughtfully demonstrate how politics and travel are truly interconnected. To be responsible travelers, and advocates of responsible travel, we have to talk about that, even when (maybe especially when) it’s uncomfortable to do so. A place’s political environment is inextricably tied to the travel experience – kudos to you for writing about it. Tourists don’t care about politics. They don’t care to learn about new places Jr things. They want to exploit and enjoy. Travelers are different. Travelers see the inextricable link between politics and travel. To travel without political awareness is choosing ignorance. I hate those dudes.